The Department of Game and Inland Fisheries (DGIF) in my home state of Virginia has confirmed Chronic Wasting Disease (CWD) in a buck legally harvested in Culpeper County during the November 2018 rut. CWD has been documented in northwest Virginia (Frederick and Shenandoah counties) for some 9 years, and we hunters in the Northern Piedmont have been holding our collective breath that it would not spread. But it has. The latest infected buck was killed in Culpeper County, 40 miles south of the original CWD zone. 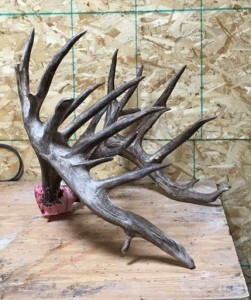 Officials discovered this CWD from a sample submitted by a local taxidermist in January 2019. 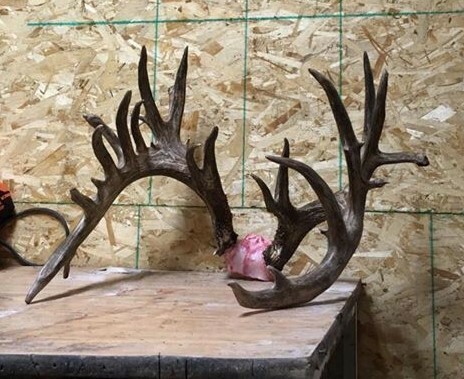 At the time this deer was harvested, the hunter did not notice any outward signs of disease, and the buck appeared to be in good condition. In a press release, DGIF said it is too early to characterize the geographic spread of the disease in Culpeper or to determine how many deer in the area are infected. Because CWD was not confirmed in Culpeper until after the 2018 deer season closed, DGIF did not have the opportunity to work with local hunters to test large numbers of deer from the area. DGIF will conduct preliminary disease surveillance in Culpeper and surrounding counties this spring and summer to make preliminary assessments about the occurrence of the disease. Methods of sample collection include working with road-kill collection contractors, responding to calls from the public about sick deer, and working with farmers and other landowners who have experienced damage from deer. Experience in Virginia and other states has shown that it can take several years before the true extent of a CWD “outbreak” becomes clear. That is one of the most troubling aspects of CWD. The Virginia DGIF is in the process of determining appropriate measures moving forward for Culpeper and surrounding counties, including neighboring Fauquier where I do most of my local deer hunting. These measures may include the delineation of a Disease Management Area, carcass transport restrictions, feeding restrictions, and the like. I predict there will be changes coming to hunting in our region. The days of loading a deer in a pickup and driving over the county line are likely over (hunters will have to quarter and de-bone the meat). Currently in summer, we can use mineral sites and bait in front of trail cameras OUTSIDE of hunting season to scout for bucks and monitor herds, but that could change. Virginia already mandates the use of synthetic deer scents, so no change there. Most certainly hunters will be encouraged to have their deer meat tested for CWD before eating it. DGIF officials will notify hunters of any changes to the regulations in the area this summer and a public meeting will be scheduled in Culpeper County to address questions and concerns about the Department’s planned management approach to CWD in this area. I would like to give a big shout-out to the Virginia DGIF for their efforts to monitor this disease. Last season, the DGIF worked with 50 taxidermists statewide to enhance Virginia’s CWD surveillance. Participating taxidermists submitted more than 1,600 samples from harvested deer, including the one from Culpeper that tested positive. ABOUT CWD: This incurable disease has been detected in 26 states and 3 Canadian provinces. 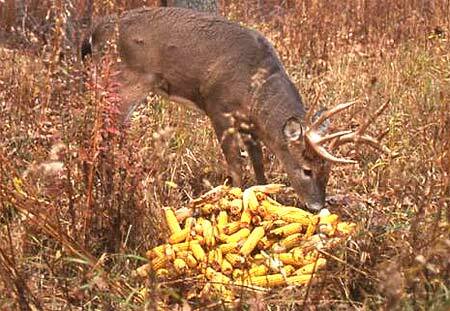 It is a slow and progressive neurological disease that ultimately results in death of the deer. The disease-causing agent is spread through the urine, feces, and saliva of infected animals. Noticeable symptoms include staggering, abnormal posture, lowered head, drooling, confusion, and marked weight loss. 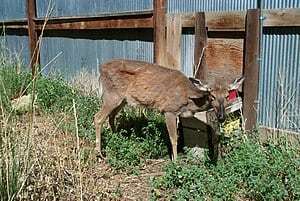 There is no conclusive evidence that CWD can be transmitted naturally to humans, livestock, or pets, but the Centers for Disease Control and Prevention instructs hunters to test all deer harvested from known CWD-positive areas and to not consume any animals that test positive for the disease. For more information about CWD: www.dgif.virginia.gov/wildlife/disease/cwd. In the United States roughly 3 million white-tailed deer are harvested each year… This translates to about 150 million pounds of meat. Add to this the amount of elk, turkey, squirrel, rabbit and other game as well as wild fruits, nuts, and vegetables that is consumed. To produce this amount of beef, chicken, or vegetable crops in addition to that which is already produced would be ecologically devastating. Acres and acres of wild places would have to be destroyed to accommodate this increased agricultural production. More wildlife habitat would have to be plowed under. More pesticides would be applied. More soil erosion would occur. More waterways would become lifeless drainage ditches. 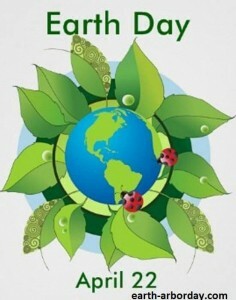 Isn’t it better that some of us reap a sustained harvest from natural systems, rather than destroy these systems? Today we celebrate that we hunters and fishers are America’s #1 conservationists and environmentalists. Alabama has a penchant for strange and confusing game laws, like the current deer-baiting regulation, which allows you to use bait as long as the feed is placed at least 100 yards away from your stand and not in your direct line of sight. Who knows exactly what that means? How could a game warden enforce it? Well, that law might change, possibly to be replaced by another unusual statute. The Alabama Times Daily reports that the state’s House of Representatives has voted to allow people to flat-out use bait—for a fee! House Bill 197 allows for baiting of deer and feral pigs on private and leased lands for a $14 annual “bait privilege license fee” and a $1 issuance fee. Out-of-state hunters would pay $50. “We have concerns about Chronic Wasting Disease (CWD) and we also have concerns about the current (baiting) law and there is an opportunity with this bill to be used as a tool for (the Department of Conservation and Natural Resources),” bill sponsor Rep. Danny Crawford, R-Athens, said. But wait… I thought one of the biggest potential problems with baiting, according to some scientists and wildlife organizations like the Alabama Wildlife Federation, is that corn or other feed unnaturally congregates deer in a relatively small area, thus possibly increasing the threat and spread of CWD and other disease? Included in the bill is this provision: The Alabama Department of Conservation and Natural Resources has the power to end baiting in case diseases are found in the state’s deer population. The bill says the state conservation commissioner may, without refund, suspend the use of a baiting privilege license on a county, regional, or statewide basis to prevent the spread of diseases. House Bill 197 was approved 85-10 and now goes to the Senate, where a similar version of the bill passed last week. The two chambers could form a conference committee to work out differences between the two versions before sending it to the governor’s desk possibly in time for the 2019-20 deer season. One November morning in Kansas, the rut was rocking when Greg Brownlee saw a doe walk out of a tree line and proceed to cross a CRP field. She stopped and looked back. “Oh boy, this is it,” he thought. Greg’s heart dropped as he glassed a young buck with one antler come out the trees toward the doe. Then he caught more movement—an enormous rack overtook the little buck and made for the doe! The hunter started to get excited, but quickly took 5 deep breaths to calm down. “If I think about it too much, I could screw this thing up,” he thought. The giant started toward the doe, but when he got about 150 yards out from Greg’s stand, he stopped and looked around slowly, like he knew something wasn’t right. He never looked Greg’s way and he didn’t spook, but turned slowly back toward the trees and Greg knew it was now or never. 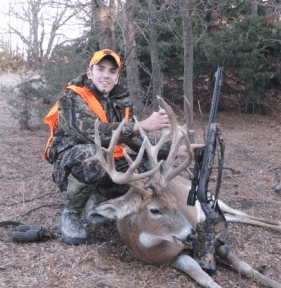 He had practiced out to 200 yards with his muzzleloader, so he was confident at 150. At the shot the buck tiptoed into the trees. Greg knew the deer hit, but didn’t see him fall. He walked over to the shot site, but found no blood. He looked around some more and started to get worried. He looked up and saw the monster lying dead in the trees 50 yards away! The 22-pointer gross-scored 218. Greg did a super job reading the buck’s body language and demeanor—and then confidently taking the shot him before the buck got away. That is a critical but often misunderstood and overlooked key to killing a big deer. Greg took deep breaths and calmed his nerves. I don’t care how long you’ve been hunting and how many bucks you’ve shot, the exhilaration and nerves are still there…do what you can to settle down. If you’re a blackpowder hunter, listen up: MANY times there is not a speck of blood at the shot site, especially at ranges beyond 100 yards. The velocity of a muzzleloading bullet (even the best new ones) is relatively low, and many times you get no pass through on a buck. The bullet stays inside the deer, and with no exit hole there is little if any blood. You owe it to the deer to look and look, and grid search, and look some more. I can’t tell you how many muzzleloader bucks I’ve shot and found dead within 120 yards, with not little or no blood to go on. 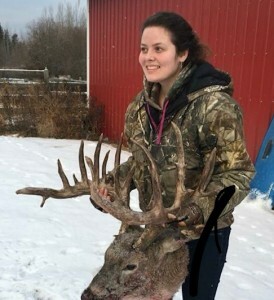 This is the first picture I saw months ago of a mystery buck/rack that was supposedly shot last November by a female hunter in the Peace River area of Alberta. You know how enthralled and obsessed I am by dark, thick Canadian racks, especially one that I know will go 200-plus, so I investigated. It took some digging but I finally caught up with @tiffcheryl on Instagram. “That’s my buck in case you’re wondering!” she posted me back. All the initial info I had seen proved true. The giant was indeed shot by a lady in Alberta last November 12. Then I was able to study the official score sheet and see just how massive this buck is! This is one of the top bucks shot anywhere in North America in 2018, way to go @tiffcheryl!